Google has released a Terms of Service update (read more) that will take affect on November 11th 2013. 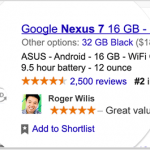 Google will use your face in Google Ads to endorse products or services you have reviewed or interacted with. Similar to Facebook recommending pages that your friends also like, Google will now be using any sharing, +1ing, or reviews you may have left for products, services, music, and movies that are advertised through Google. How do I stop Google from using me in promotions? If this sounds like it’s going to become a problem for you, especially if you’ve ever reviewed or shared a post or update that you may not want your name tied to, (for example my never dying love for Sam Adams Octoberfest) then you have a few options. If you’re not the customer, you’re the product. From a marketing standpoint, I think this is great. How often do you scroll through Facebook and see a sponsored post that says “Mary, Billy, Joan, and 9 others like this page!” That grabs your attention. In todays day and age, word of mouth is still the most powerful driving factor to purchase. If your friends trust it, you trust it! Unless your friends are a bunch of liars! 3 Responses to "Google will use Your Face in Google Ads"
Great article. I think this actually sound more so exciting than scary as you will be able to get your face out there across the web just by leaving reviews on products and services. It sounds like a win win for both the company and the reviewer. That is true, if I leave a public review on a product or service then it’s my expectation that anyone can see that comment at any point!